Details on the Resident Evil 7 Collector’s Edition have arrived, and it comes with a small, creepy replica of the Baker mansion, which players will be tiptoeing around in the actual game. Just in case you didn’t have enough tiny horror in your living room. The Collector’s Edition is exclusive to Gamestop and comes with a replica of the Baker mansion which is a decent size, standing about 8 inches tall, 7.5 inches long, and 8.5 inches deep. As if that wasn’t unnerving enough, the grey, decrepit house doubles as a music box which apparently plays a “familiar tune”, although god knows what that tune will be. LEDs flicker on and off whilst the spooky music is playing, but I would advise against using it as a nightlight. 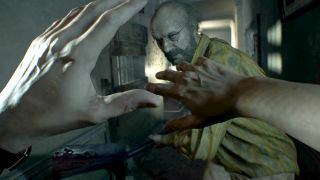 As well as a house, the Collector’s Edition comes with a dummy finger (similar to the mysterious one which features in the latest demo), which has confounded fans, as it doesn’t have a clear purpose yet. The finger comes in a video tape box which, thankfully, doesn’t play the horrifying footage from the demo, and the game itself comes in a metal case. You’ll also get a not-so-charming lithograph (a high quality print) of the Baker family to hang on your wall - or not, depending on whether you want nightmares. Just in case you weren’t creeped out enough, the Collector’s Edition also comes with a scrawled note from one of the mansion’s residents. This house of horrors will set you back $179.99 and is available from the 24th of January 2017.